Traveling overnight with little ones is now easier than ever, thanks to the newly re designed BABYBJORN Travel Crib Light 2. Travel Crib Light 2 offers the same great features as the original Travel Crib Light, but a new leg mechanism now makes it even easier to take down. Lightweight and portable, the crib is the ideal solution for making your baby feel comfortable and safe when sleeping away from home. It sets up in seconds and features a plus, c ounce y mattress and a sturdy base that doesn’t wobble.Traveling overnight with little ones is now easier than ever thanks to the newly re-designed BABYBJÖRN Travel Crib Light 2. The Travel Crib Light 2 offers the same great features as the original Travel Crib Light, but a new leg mechanism makes it even easier to take down. Lightweight and portable, the crib is the ideal solution for making your baby feel comfortable and safe when sleeping away from home. It sets up in seconds and features a plush, cozy mattress and a sturdy base that doesn’t wobble. The lightweight Travel Crib Light 2 is a breeze to take down and carry around when traveling. The lightweight construction of the Travel Crib Light 2 makes traveling hassle-free for parents. Weighing less than 11 pounds (including the case), the crib is easy for any adult to carry around the house, pack into a car, or carry through an airport. Made of soft fabric, the Travel Crib Light 2’s insulated mattress is both cozy and roomy, creating a restful environment for your child wherever they happen to be. It also comes with a removable, waterproof cover, which helps protect against leaky diapers. Assembly of the Travel Crib Light 2 is an easy task. Especially convenient after a long day of travel, the crib takes seconds to set up or take down. 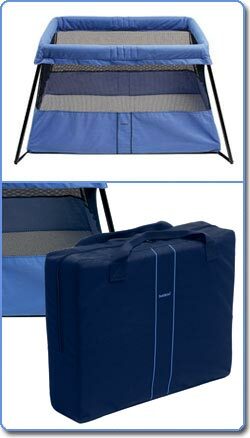 Just remove the Travel Crib Light 2 from its travel case and unfold the frame — no pushing, pulling, or locking of rails is necessary — the legs will automatically set and lock in place. Once the frame is set-up, simply place the mattress in the bottom and you are set for sleep. All of the fabric and materials used in the Travel Crib Light 2 are Öeko-Tex Standard 100 Class 1 certified, which means they are guaranteed to be safe and free of any harmful substances. The cotton mattress cover and fabric on the exterior of the crib are removable, machine washable, and smooth on your child’s skin. The BABYBJÖRN Fitted Sheet (sold separately) is a perfect fit for the Travel Crib Light 2. A family owned company headquartered in Sweden, BABYBJÖRN has been producing innovative childcare products since 1961. Today, BABYBJÖRN works with an international network of pediatricians to develop products that reflect its core philosophy of quality, safety, and style. BABYBJÖRN ensures the quality of each of its products–in terms of both durability and environmental impact–by scrupulously overseeing every stage of the design and manufacturing process. Safety is also guaranteed through rigorous screening by industrial designers, testing institutes, and medical experts. This exacting attention to detail has earned BABYBJÖRN international recognition for its success in creating products that balance usability with style. BABYBJÖRN Travel Crib Light 2, mattress with cover, carrying case, and use instructions.